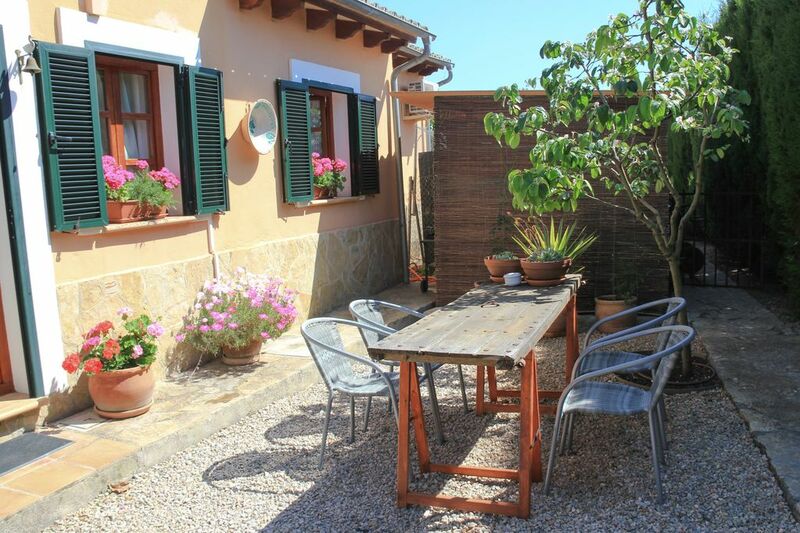 Quiet and sunny guesthouse located in the beautiful Majorcan countryside, very near the city of PALMA (7km). The guesthouse is 30m (90ft) from the main house, in an independent area. It consists in 1 double bedroom, livingroom with 1 sofa bed (ideal for 2 kids) plus 2 armchairs, 1 full bathroom, 1 half bathroom, a fully equipped kitchen, backyard with BBQ, garden and shared swimmingpool and 1 parking spot. The guesthouse provides you with all the comfort for your holidays. It is cool during the summer(A/C), and sunny, warm and cozy during the winter (central heating). There is one parking space for the guests. are available & saltwater swimming pool, which measures 60m2, it is 1,10m deep in the less profound area and 2,20m in the most profound area. The use of the swimmingpool is at guests' own risk. It can only be used by them (not by friends). The guesthouse is a delightful hideaway at the foothills of Serra de Tramuntana mountains, which recently obtained the qualification of World Heritage of Humanity and Culture Site by UNESCO. This property is only 10- minutes walk from Son Sardina, a nice residential neighbourhood with all the services like organic products for sell, restaurants, supermarket, cafes, pharmacy, bakery, butchery, tennis and paddle courts at UDYR Sport Club, and also a football field in Son Sardina. Very near you will find Sa Gubia, a beautiful farm for the family to enjoy horseback riding. There is a BBQ in the backyard and table ping-pong with rackets and balls. The swimmingpool is of common use for the guests and the owners' family. Children under 2 years old can stay for free. Baby cradle available. We loved this cottage and beautiful gardens ! Very convenient and well appointed. It was 5 unforgettable days in Mallorca. I enjoyed where the house is located, away from traffic and noise. Using google maps, the place was easy to find. About 30 minutes of driving from the airport. Stefan and Chloe, guest assistants, were very helpful and friendly. Ana, the owner, is super hospitable! Million thanks to Ana, Stefan and Chloe for being such amazing hosts! My husband and I enjoyed our stay in this guesthouse. It was a lovely house that had all the essentials that we needed. Besides toilet paper, but no biggie we were on the way to the supermarket so picked some up with our shopping. Guesthouse had a pool, but the pool was a bit cold due to the weather outside. Lovely house and we very much enjoyed our quiet stay after a long week at Madrid, and Sevilla our last stop was here to relax. Glad we visited, and recommend this guesthouse for your next trip if you are on the island! Wir hatten eine prima Zeit. Der Garten ein Traum, die Lage so nah an Palma ist Klasse, dennoch ist es super ruhig. Das Häuschen ist gut ausgestattet. Wir waren mit unserer 8 Monate alten Tochter dort. Für zwei Personen mit kleinem Kind (im Babybett) perfekt.